My dad came over from Prince George for a visit, and weekend time meant a day out fishing for pike. While the conditions were windy and the fishing was somewhat slow, we ended up having an excellent day bringing six sizeable pike home to be turned into tasty fillets. It was in cleaning them that we saw what these northerns were up to. Five of the six had full-grown whitefish in them. I figure the smallest white had to be 13 inches and the largest one was at least 17 inches. Now who drops a 17-inch fish off a tip-up? Not many, but those that do often get the big bites. Playing on that strategy I went to the Fishin' Hole and raided their supply of the largest herring available. The next weekend Trevor McLeod, Ivan Isop and myself did a trip to Lac St Anne, chasing the burbot. 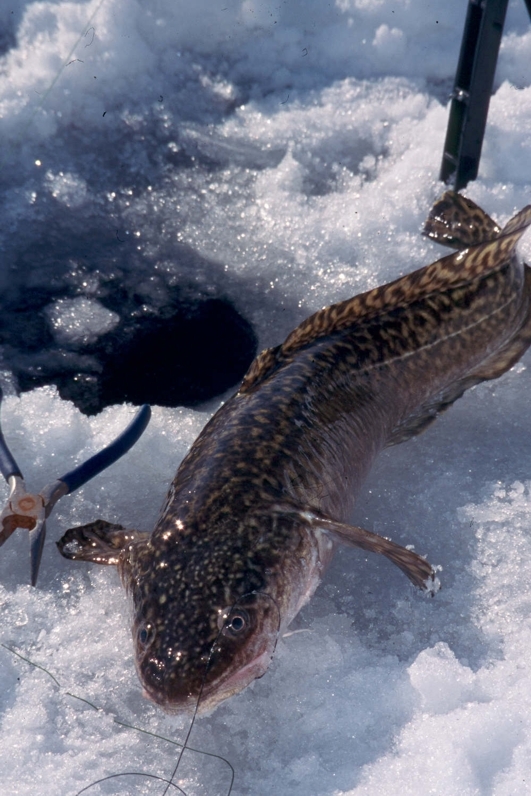 The burbot season is a wonderful time of year. 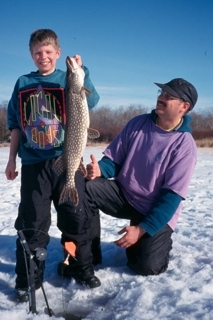 When the burbot are in, they provide excellent fishing. 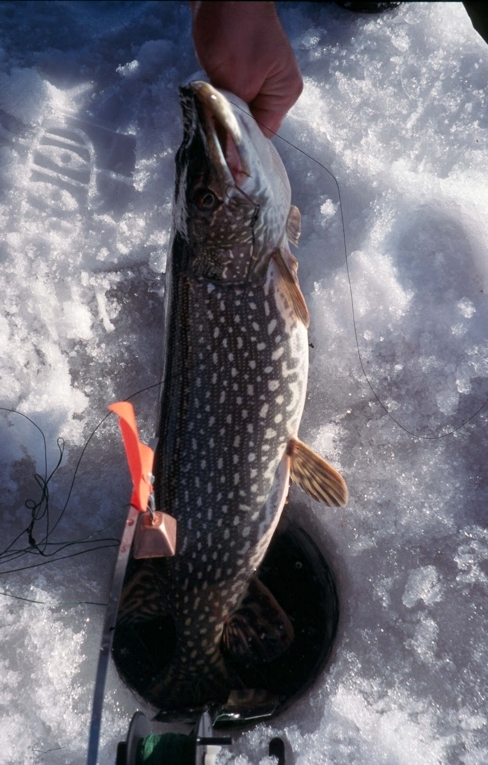 As do the whites, which like to eat burbot spawn, and the pike, which like to eat the whites and burbot. We set tip-ups a 100 or so feet away using the largest of herrings as bait. What surprised us was how eagerly the tip-ups got smacked. They must have accounted for a dozen or more bites over the course of the afternoon. Far better than the three of us were doing jigging. 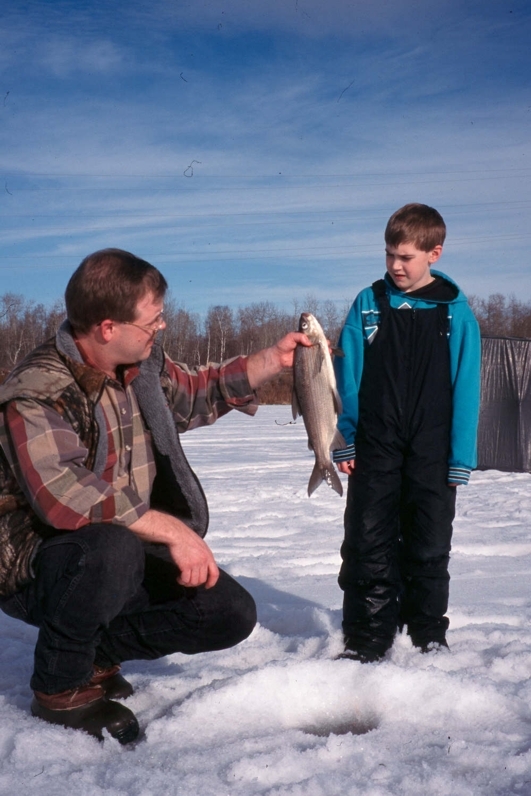 We caught three burbot, a small pike and a decent walleye, but the encouraging fact was that the largest of our herring were routinely hit. It just goes to show that presenting bait in a natural manner, no matter how large it may seem, will get bites. 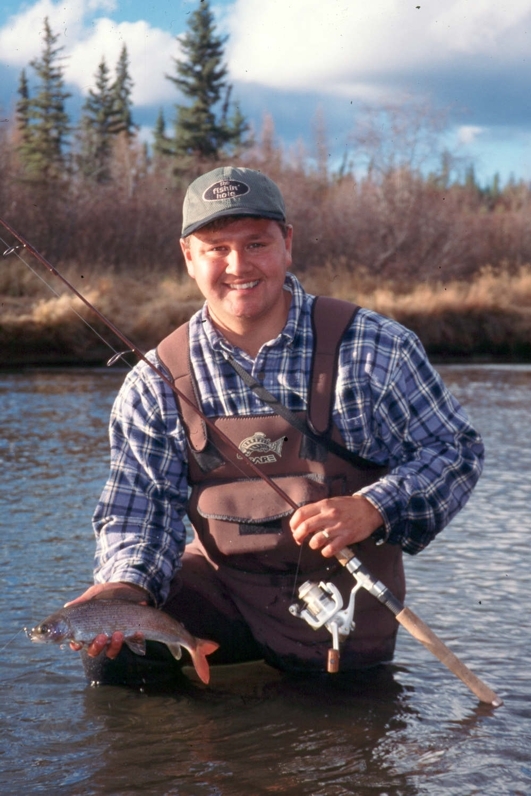 Keeping in tune with the learning theme, about a half dozen years ago I did something I don't often do when trout fishing. I got up before the sun and headed out in my boat. What a stroke of genius that was. While paddling away from shore I noticed subtle disturbances here and there tight to shore and quite shallow. Slowly and quietly I drifted in I found those disturbances were the tell tale signs of large feeding trout. 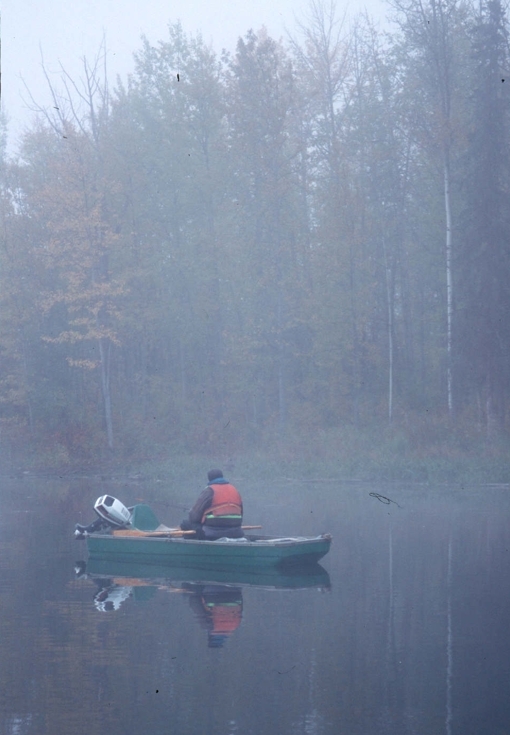 It was amazing, but there in front of me were numbers of two to seven pound trout routing around, looking for food. Nobody else was on the lake, the water was perfectly still, save for a few rummaging trout and there I was in the right place at the right time. As quietly as possible, I worked my way close and cast the plug a few feet to the side of a disturbance. A few twitches sent a big bow wake straight at my floating plug where a sizeable trout lifted its nose and sucked it in. That was the start of a truly memorable morning, where I caught big trout hand over fist until the sun snuck over the horizon. I've done this early morning hunting routine many times since and most every trip has been a winner. My first ever trip to the North Ram River was both exciting and rewarding. The talk at the campsite was that those willing to walk a little further off the beaten path could catch big cutthroats. Our plan was to do just that and when we emerged from a 20 minute slog through the bush we found two corner pools close to each other with the upstream pool about as beautiful as they come. It was cool, clear and full of cutts. That was obvious because at the head of the pool a half dozen or more sizeable fish were steadily rising to some mayfly. I floated my best mayfly imitations at them and didn't get a sniff for my repeated efforts. Not to be deterred I waded to the lower end of the pool and flipped over some rocks. There I found some small mayfly and larger stonefly nymphs. That was all the clues I needed. I switched to a stonefly nymph and fished it along bottom. On my first drift a massive 20-inch cutt picked it off. It remains my largest North Ram cutt to date. I've seen two that were bigger, but I've never caught them. 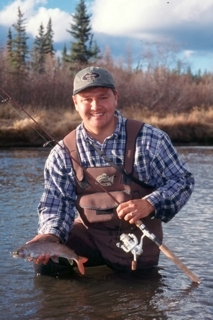 The nymph was the ticket that day and because I switched to the subsurface game, I caught lots of cutts. No matter where we fish there are always clues to help us along. Some of the best fishermen and fisherwomen are the ones that spend the time to look around and see what's going on first. Using that information will help plan an approach and ultimately, catch more fish.